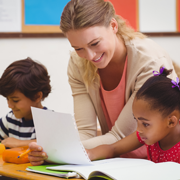 The State of Michigan has made changes to their early childhood professional development registration policy. In order to receive state recognized professional development hours, all participants are required to create an online account at miregistry.org. The registration process is quick and easy. Each individual must create his or her own account. The website has a guide on how to register, as well as how to search for trainings. You can search for professional development offered at The West Bloomfield Township Public Library or in Oakland County. This website will track your professional development hours. Certificates of completion will be available in your online profile after your training attendance is verified; paper certificates will no longer be distributed. The State of Michigan and Great Start to Quality offer various opportunities for professional development. There are childcare trainings offered throughout Oakland County that touch on many different subjects related to early child development and best educational practices. These trainings are created to help improve the quality of your childcare program. If you need further assistance with registration, online accounts or searching for additional trainings, please contact Mireistry at mi.newworldnow.com. We look forward to another great year of early childhood professional development!